Planet of the Apes is one of those franchises that has survived the test of time in the hobby. Different sets have come decades apart and from several different manufacturers. But they had to start somewhere. 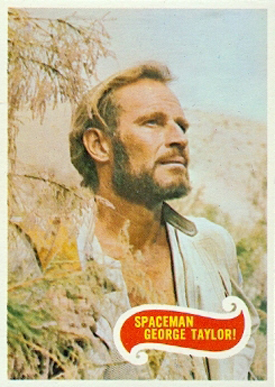 1969 Topps Planet of the Apes offers a cardboard recap of the Science Fiction classic that stars Charlton Heston. The set has just 44 cards. However, the popularity of the set makes building a set a challenge today. 1969 Topps Planet of the Apes card fronts have a simple design. A large image is complimented by only a small scroll-like ribbon. This red scroll has a caption. The images also have a small white border. Card fronts mix vertical and horizontal images. The backs are much more intricate. A large Planet of the Apes title is at the top of the card with a lengthy writeup underneath. This writeup is framed with intricately drawn foliage. The side of the card has illustrations of Dr. Zaius and two ape soldiers. 1969 Topps Planet of the Apes card backs are green. 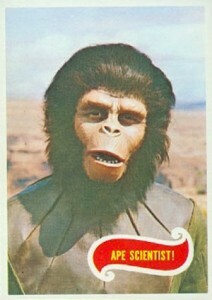 Topps later produced a set for the short-lived Planet of the Apes TV show in 1975. These cards look very similar. Card fronts have an identical design to the movie set. However, the backs for the 1975 Topps Planet of the Apes set have puzzles incorporated into them, which make them easier to identify. This set did, indeed, come out in 1975 despite the 1967 copyright written in the fine print. 1969 Topps *PLANET Of The APES* Movie Green Back Card # 10 "Another Prisoner"
5 First Sign of Life! 8 Captive of the Apes! 24 Human on a Leash! 41 Friends of the Human! Hi looking to trade 7planet of apes cards.for 19” 15” 50” 59’+ cash can you help. I have a full set of 1969 Planet of the Apes trading cards 1-44 in almost excellent condition that I would like to sell. How much would this set be worth? I have seen individual cards selling for 20.00 each. 1967 Topps Planet Of The Apes Near Complete Set EX Condition! + 1 Wrapper! !